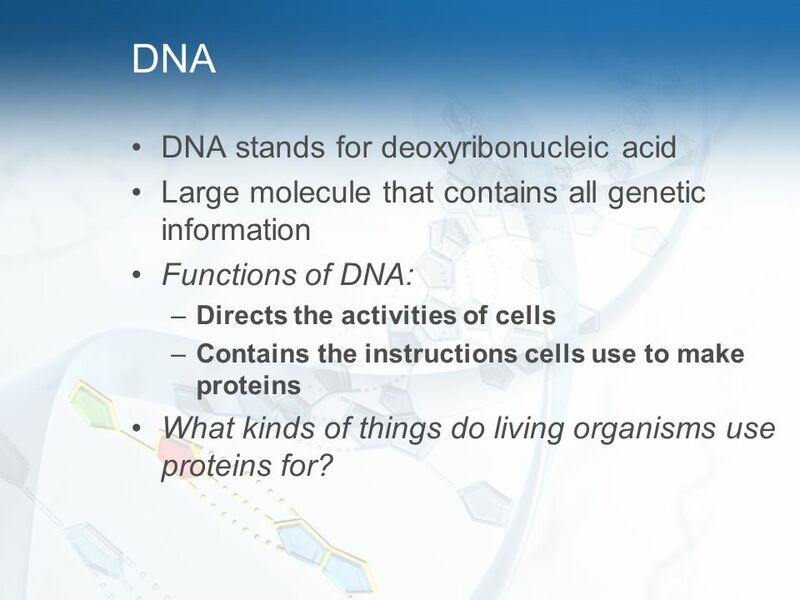 Large molecule that contains all genetic information Functions of DNA: Directs the activities of cells Contains the instructions cells use to make proteins What kinds of things do living organisms use proteins for? 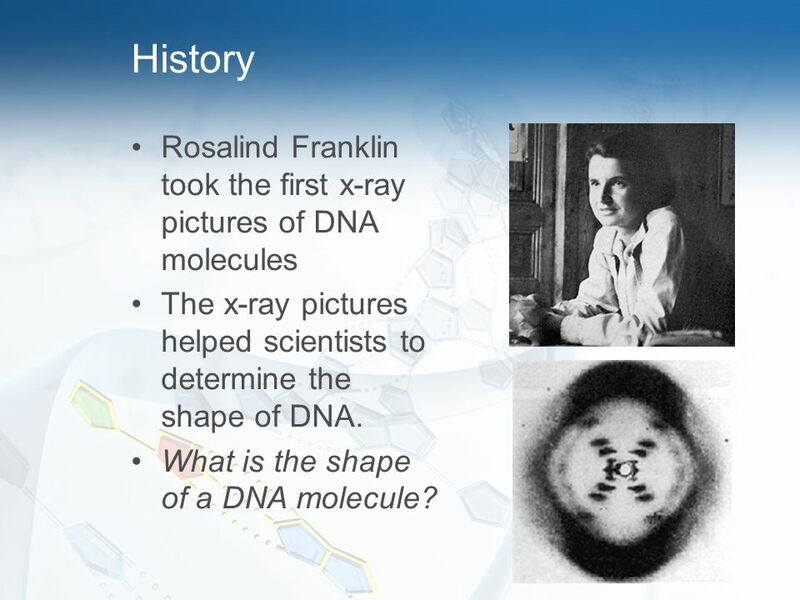 4 History Rosalind Franklin took the first x-ray pictures of DNA molecules The x-ray pictures helped scientists to determine the shape of DNA. 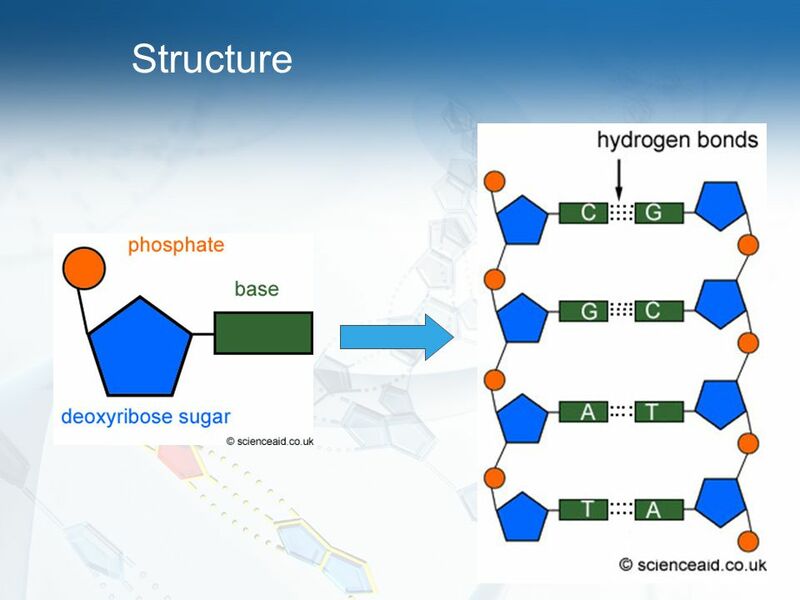 What is the shape of a DNA molecule? 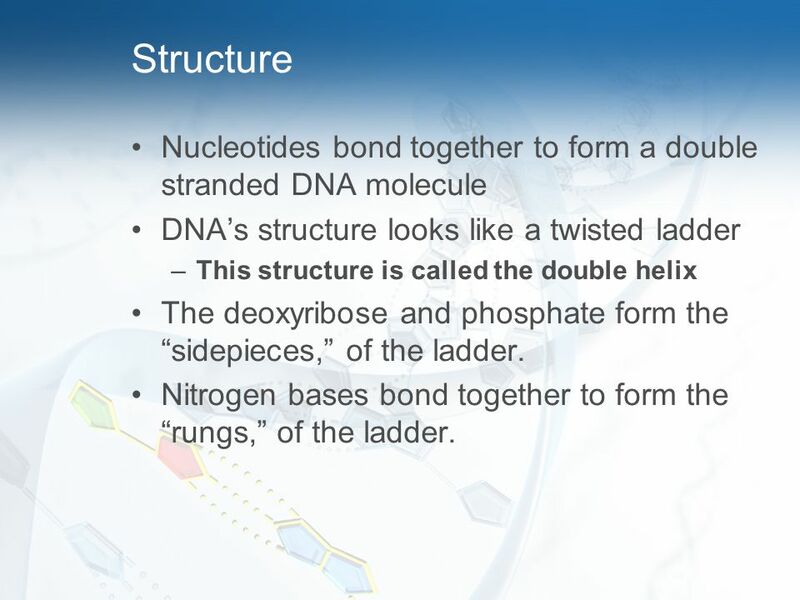 9 Structure Nucleotides bond together to form a double stranded DNA molecule DNA’s structure looks like a twisted ladder This structure is called the double helix The deoxyribose and phosphate form the “sidepieces,” of the ladder. 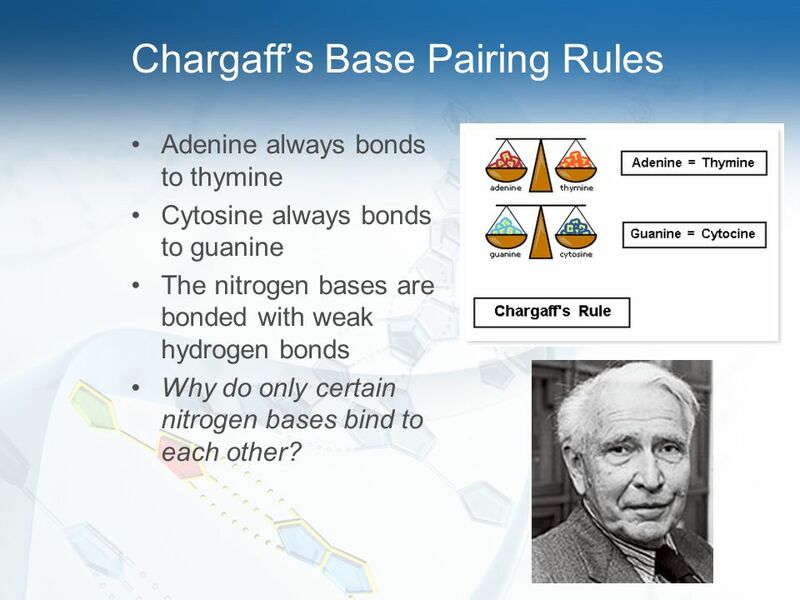 Nitrogen bases bond together to form the “rungs,” of the ladder. 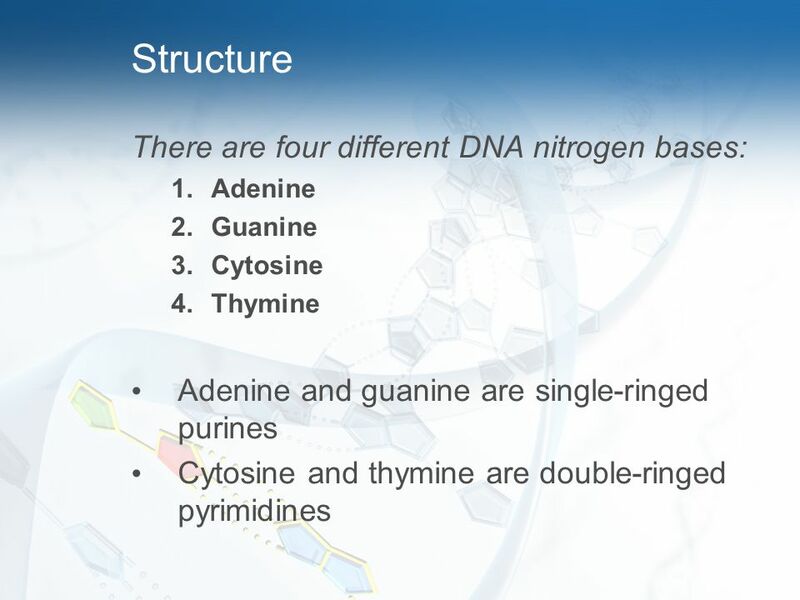 Adenine always bonds to thymine Cytosine always bonds to guanine The nitrogen bases are bonded with weak hydrogen bonds Why do only certain nitrogen bases bind to each other? 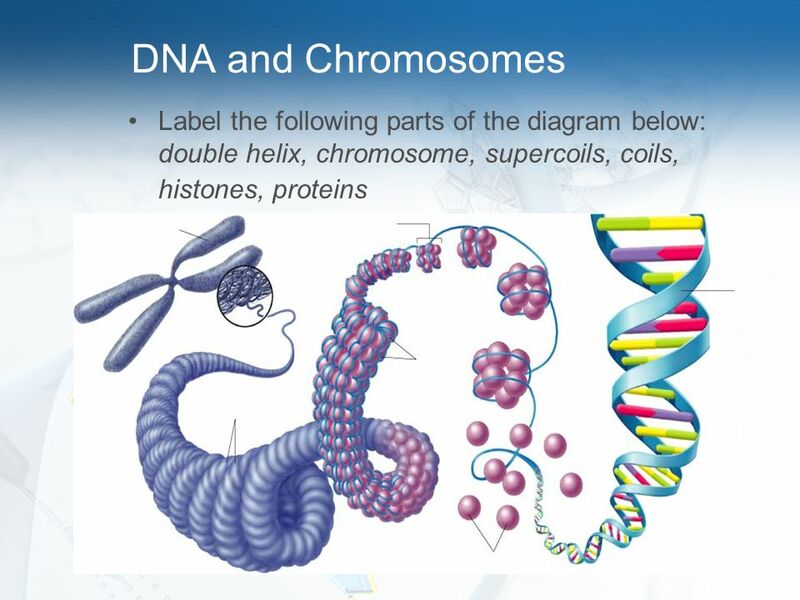 Download ppt "DNA Structure and Function"
The Structure of DNA The Double Helix. 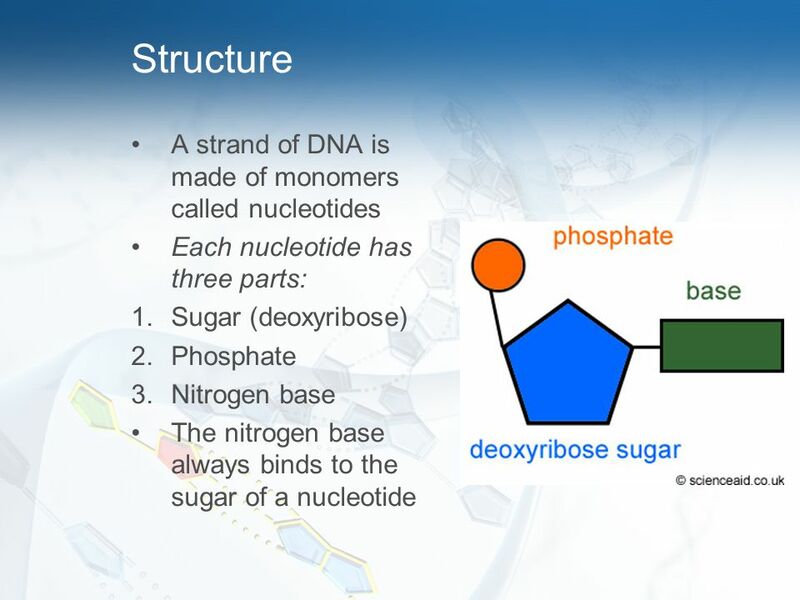 DNA = Deoxyribonucleic acid DNA is made up of small sub units called Nucleotides A Nucleotide Has 3 major parts. Warm-Up Where is DNA found? What is DNA? 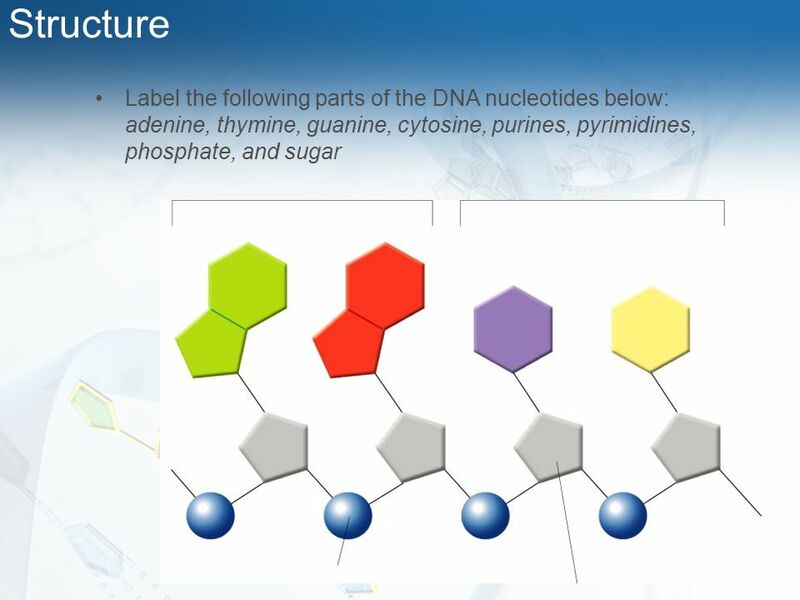 DNA Structure The Genetic Material. DNA: The Molecule of Heredity. DNA Structure Deoxyribonucleic acid. A macromolecule composed of two strands of monomers called nucleotides. These strands. 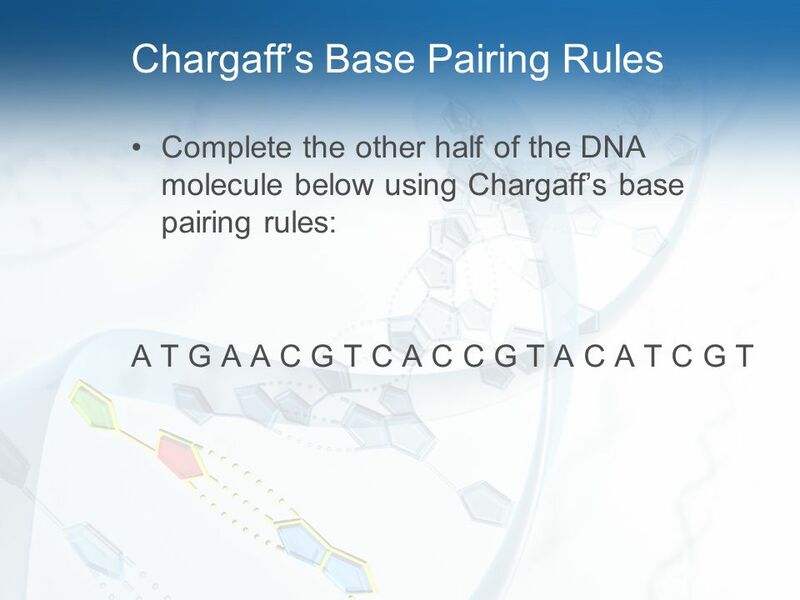 Chapter 8 From DNA to Protein. 8-2 DNA Structure 3 understandingsGenes 1. Carry information for one generation to the next 2. Determine which traits are. 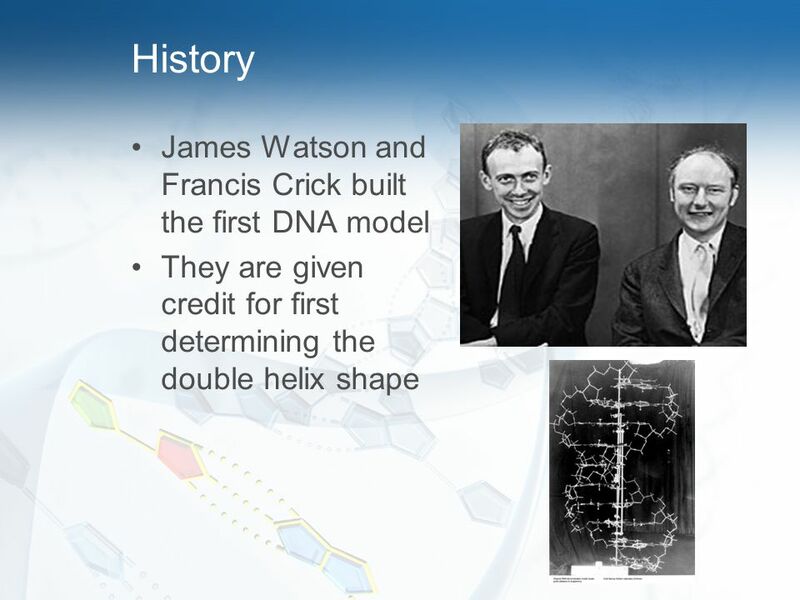 1953: The structure of the DNA molecule is first described. 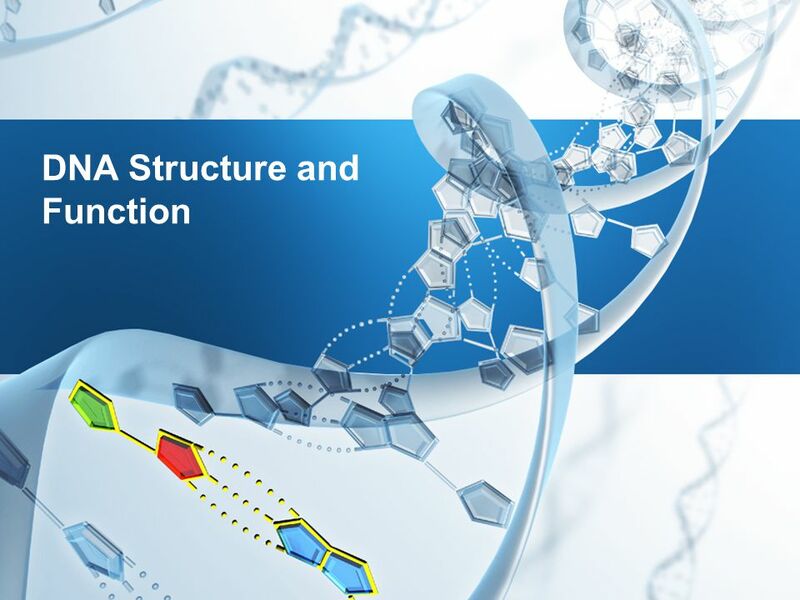 DNA: Structure and Function. DNA Structure Deoxyribonucleic acid. A macromolecule composed of two strands of monomers called nucleotides. These strands. 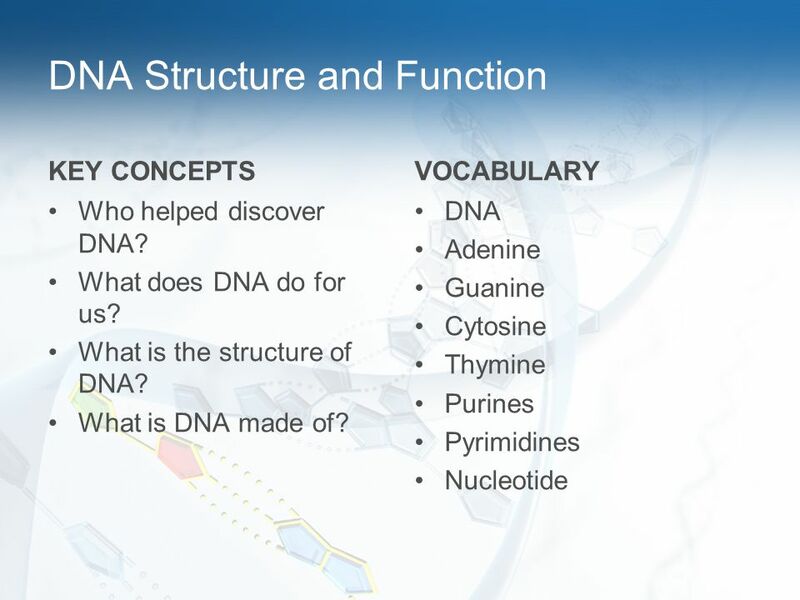 Essential Question: What is the overall structure of DNA. 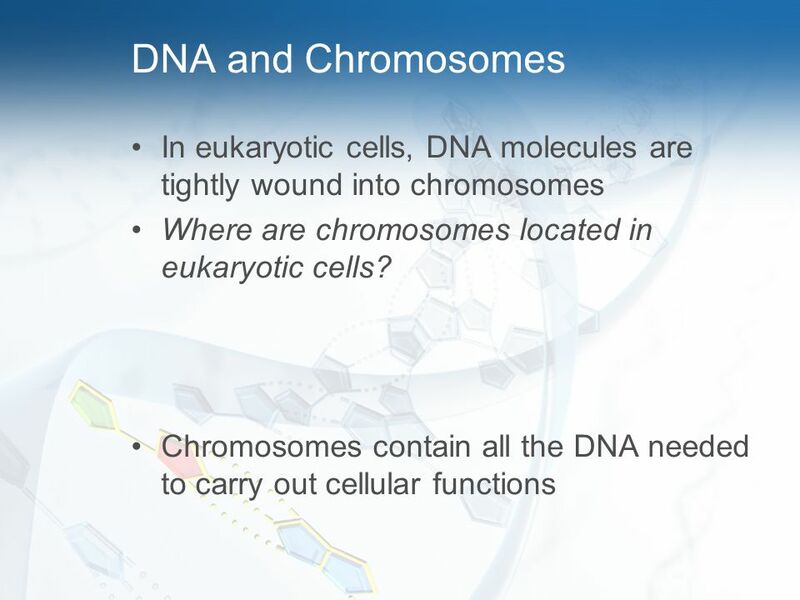 Warm Up Where is DNA located within a cell? Why is DNA important? 11.2 Notes DNA STRUCTURE. What is DNA? 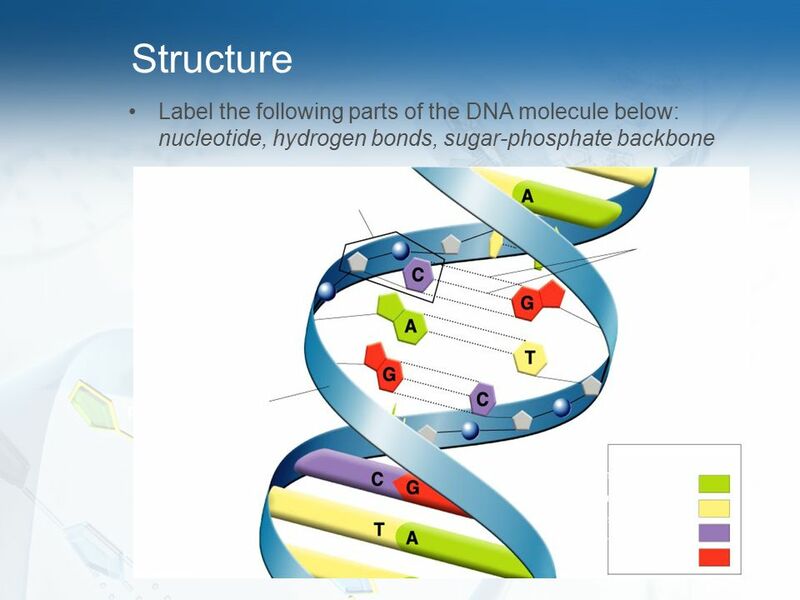 Deoxyribonucleic acid = DNA Deoxyribonucleic acid = DNA Heritable genetic information Heritable genetic information.